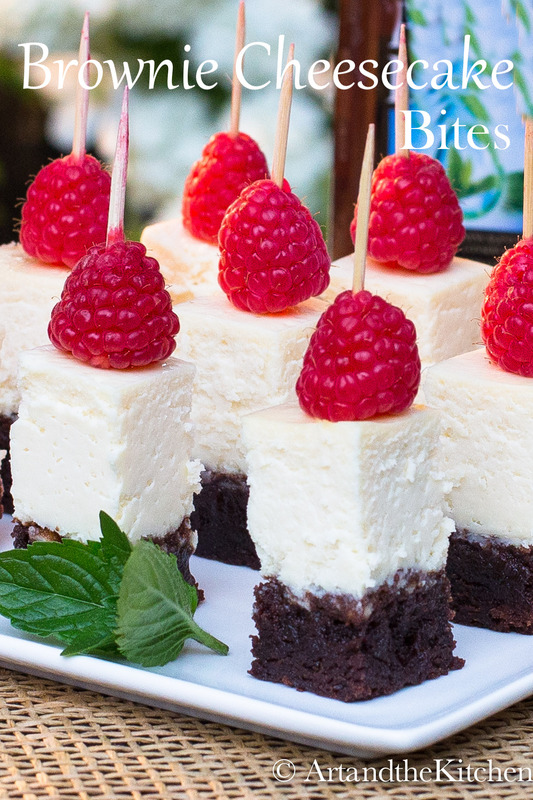 Brownie Cheesecake Bites are made with a chewy fudge brownie crust, topped with a creamy cheese cake layer. Two wonderful desserts in one delicious bite! This is a fairly simple dessert to make. I used a store bought brownie mix, but a great homemade brownie recipe like my Ultimate Brownie Recipe is even better! I didn’t have a square springform pan so some pieces were not perfectly square. (what a great excuse to sample). If you like cut into larger triangle pieces, plate, decorate, and serve with fresh raspberries or raspberry sauce. Preheat oven to 350 degrees F. Grease bottom only of 9-inch springform pan. Prepare brownies as per package instructions. In large mixing bowl, beat cream cheese until fluffy. Add in sweetened condensed milk. 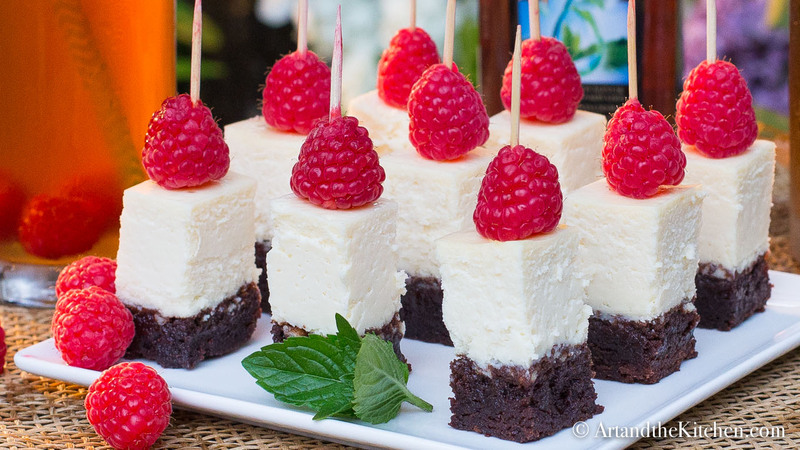 Pour cream cheese mix on top baked brownie layer. Cool, then chill for at least 2 hours. adapted from Eagle Brand recipes. Try this using my Ultimate Brownie recipe for a superior brownie crust. Who doesn’t love cheesecake? It is my all-time favourite dessert. 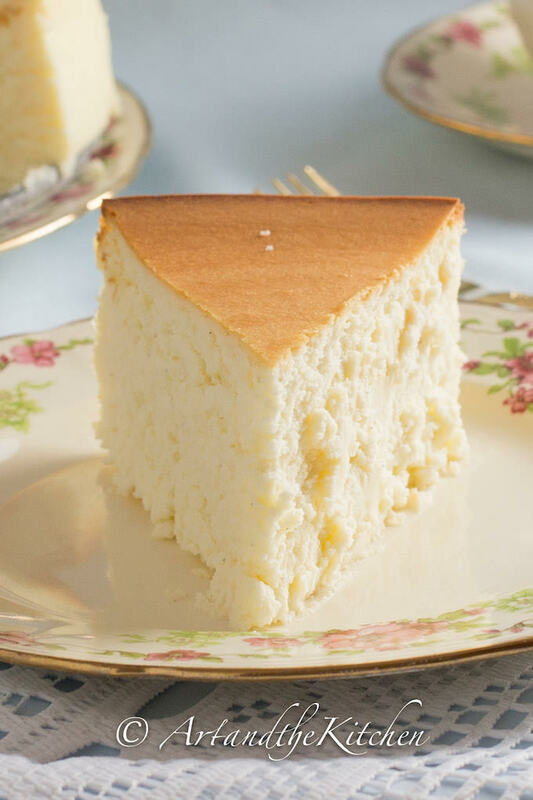 My Tall and Creamy New York Cheesecake is another great cheesecake recipe to try. 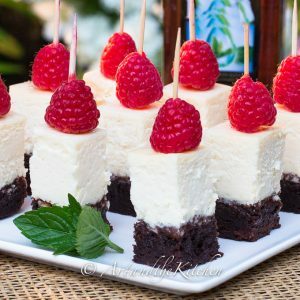 You are a wonderful blogger….love all your delicious recipes with great instructions. Your presentations are “perfection”. The Artist in you really comes out in your beautiful pictures. wow this looked really good…. but…… as I read your instructions they are incomplete and confusing. 1. 9in pan???? is that 9×9 is that 9×13 ? is that 9in springform ? im thinking not springform because of your perfect little square bites? 2. you list 1/2 cup sugar but nowhere do you mention when to add in your instructions? and # if you only grease bottom of pan for brownie how does the cheesecake part not stick ? and no waterbath ? did you have no cracking on top after 50 minutes ? Thank you Karen, I really appreciate you pointing the errors I made in writing up the instructions. I did use a 9 inch springform pan. Normally you would cut the pieces into pie shaped pieces, but I wanted little bite size pieces which does leave you with some “not perfectly” square pieces or scrap pieces (which of course I ate). There is no sugar required in the recipe as the eagle brand milk is sweetened. (I have corrected that). I did not bake in a water bath, and had no problem with cracking. I do apologize and hope you try the recipe. Can you make this in a 9 x 13 pan and will the brownies get overdone cooking them for that long?? These look amazing!!!!! Hi Cindy, a 9×13 pan would be too big, you would have to bake it in a 9×9 square pan. Can this be held for 24 hours before cutting and serving? Kirstie, yes you can cut pieces whenever, just keep it covered and refrigerated. Do the brownies get over cooked? I’ve never had a problem with the brownies over cooking. 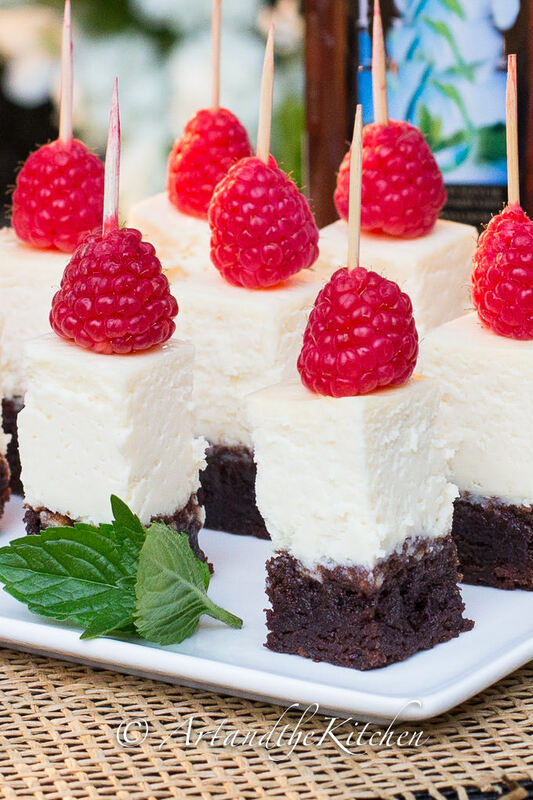 The cheesecake layer prevents brownies from drying out. If making the tall cheesecake I only have a 9″ springform how far up I the pan should I pour the batter to? I will use the leftover batter for another delicious dessert. Hi Janice, I would leave an inch from top. Bake remaining batter into cupcakes.